Is your toilet clogged? If so, this is one plumbing repair you may be able to tackle yourself. While some more serious clogs require the intervention of a professional plumber, there are some things you can try before you pick up the phone. Reach for a plungerEvery home should be equipped with at least one plunger. This necessary household item is your first line of defense against a clogged toilet, and you don’t want to wait to buy one until dirty water is flooding your bathroom. Before using the plunger, take the lid off your toilet tank and push the flapper down to prevent additional water from entering the bowl. Then start plunging and see if this eliminates the problem. 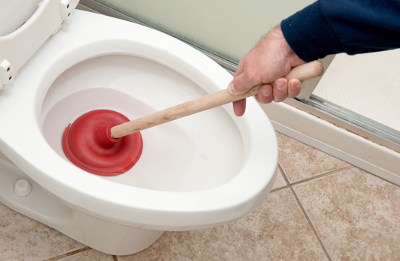 If nothing happens the first few times you pump the plunger, don’t be discouraged — it can take some elbow grease and vigorous pumping to get the job done. Grab a snakeIf a plunger doesn’t do the trick, your next best option is to snake the drain. A drain snake is relatively inexpensive and can be purchased from most hardware stores. Put the snake into the toilet bowl and feed it carefully into the pipe. Once it reaches the clog, you’ll feel a slight increase in resistance. At this point, turn the snake clockwise to allow the tip to break up the clog. Call a plumberIf neither of these tactics work, it may be time to leave it to a professional. Sometimes a clog may not merely be built-up debris in your toilet, but an object dropped in by a child or knocked in by a clumsy house guest. You’re better off having a professional plumber clear the pipe and make any necessary repairs rather than attempting it yourself and causing additional damage. Consider calling a plumber at least once a year to ensure not only that your toilet’s working properly, but that all the pipes in your bathroom are free of leaks and clogs. Your local Rods Away plumbers are always here to help. Give us a call and we’ll clear the clog and get your toilet back in working order.